Hardware Store - Playalinda Brewing Co.
Titusville’s only craft beer micro-brewery. 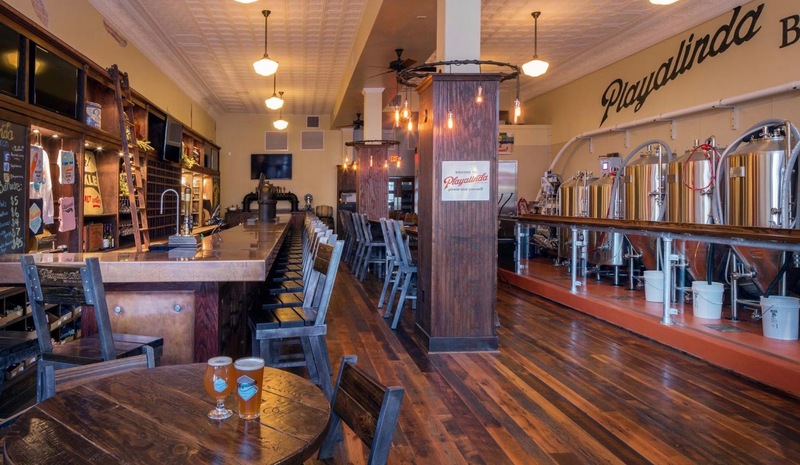 Nestled in a renovated, 100 year old hardware store in historic downtown Titusville, Playalinda Brewing Company first opened its doors in 2014. Named after the Space City’s go-to beach, Playalinda has since become a gathering place for both locals and visitors alike. The variety of beers on tap is constantly evolving, creating a freshly brewed experience each time you stop in. Enjoy a flight and a bite to eat at the bar, settle into our community seating with a board game and make some new friends, or bring the pooch and pair a pint with some people watching at one of our street-side, outdoor tables. Playalinda Brewing Company – Hardware Store is always well-stocked with Playalinda-brewed beers, rotating guest taps, coveted craft bottles, cider, wine and non-alcoholic options – making it easy to please the palate of everyone in your crew. Our menu features lighter fare designed to compliment our craft beer selection. Whether you’re looking to fill your growler with fresh craft beer, a gathering place to connect with old friends, or just happen to wander in on your way home from the beach – a visit to the Hardware Store is always time well spent. Exercise your brain every Monday with Playalinda Monday Night Trivia, starting at 7 p.m.